"When there is perfect harmony between body and mind, we achieve self-realization. Yogic science does not demarcate where the body ends and the mind begins, but approaches both at a single, integrated entity. The turmoil of daily life brings stress to the body and the mind. This creates anxiety, depression, restlessness, and rage. Yoga asanas, while appearing to deal with the physical body alone, actually influence the chemical balance in the brain, which in turn improves one's mental state of being." "Yoga does not deepen by simply adding more and more spectacular postures but rather by tuning into the workings of relationship between mind and body and learning how to use yoga postures as a tool of meditation. From there we can create an authentic spiritual practice that helps us remove the physical and mental habits that keep us from genuine freedom." 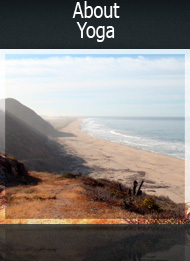 Hatha Yoga is the most popular yoga system practiced in Western culture. It uses the body as a "sacred doorway" through which we focus our awareness and where our inborn potential for well-being is unleashed. While applying specific movement to the body along with involving our breath and mind, we can rejuvenate and re-balance all the bodily systems. Yoga postures when practiced consciously, encourage concentration, inner stillness, perseverance, patience, self-acceptance and self-awareness. Consistent practice can bring clarity to the emotions, anchor feelings on a base of deep relaxation, and help us develop the ability to witness ourselves. In simple words, yoga is described as the means to realization of one's true nature. Hatha Yoga can be practiced and enjoyed by absolutely anyone. It intends to serve as a universal instrument to allow awareness and wholeness of body, mind and spirit.